6.5 inch Bowl in Marigold. BUTTERFLY BOWER - Quilted Diamond exterior. 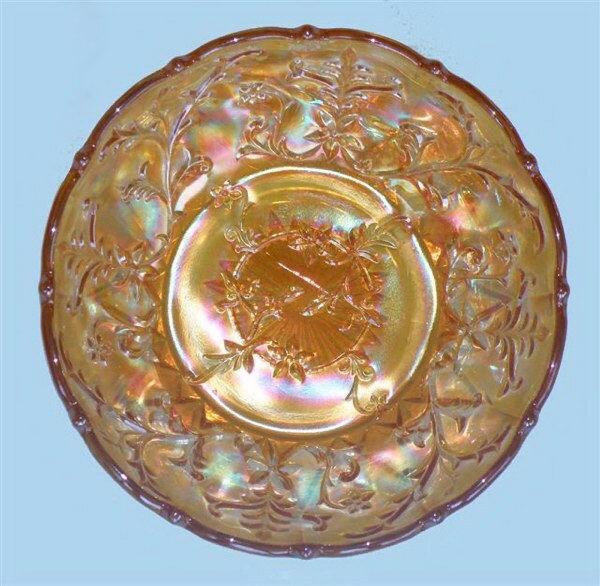 BUTTERFLY BOWER / QUILTED DIAMOND: These 6 ¼”-6 ½” diameter bowls in marigold or dark can exhibit the Butterfly Bower interior or have a plain interior. 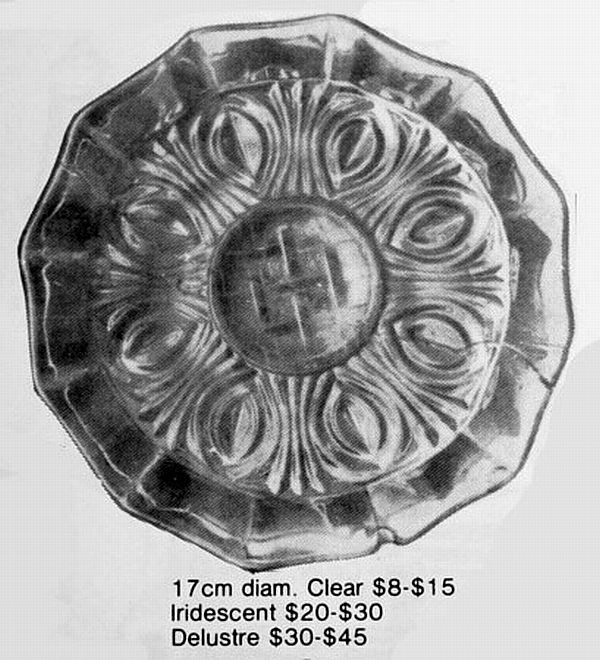 The Quilted Diamond exterior is found with Bullet edge, while Broken Chain is the exterior pattern when Ruffled edge is found, according to information contained in Carnival Glass of Australia by ACE Association. 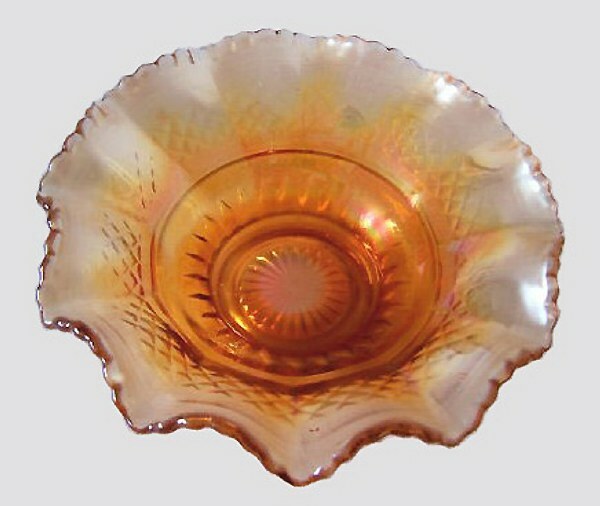 The Ken Arnold book on Australian Glass brings Roselin and Citron colors into play. 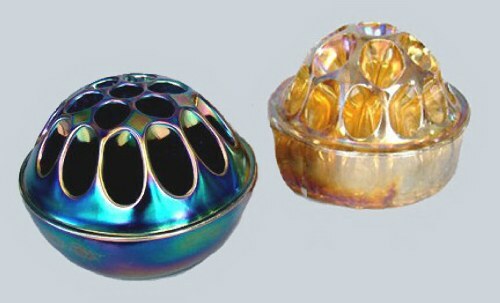 Over time, examples found/owned by collectors indicate these can be iridized or non-iridized. Whether those not iridized lead to newer, more recent production continues to be an unsettled question. The long-time collectors we are in touch with offer no conclusive answer. Examples displayed in this segment “appear” to have no iridescence. 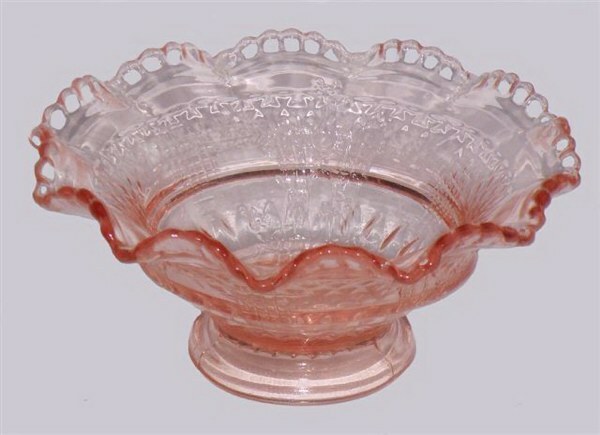 The base glass colors are interesting and perhaps would indicate manufacture during the 1930s, when Depression Glass produced in the United States provided pastel shades of glassware, leading buyers out of the previous carnival glass era. STYLE 7 inch Ruffled Bowl in Citron Green. 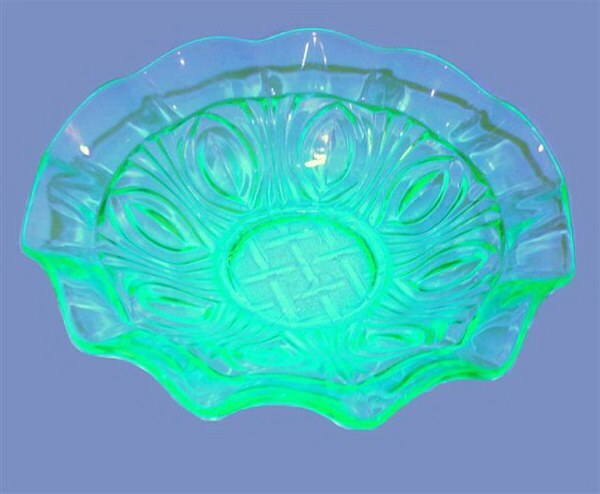 STYLE 7 inch Bowl in Citron Green (Glows). STYLE - Pg. 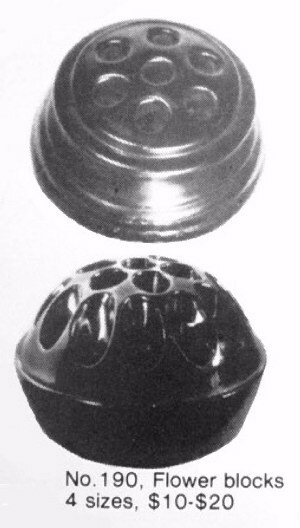 51- Australian Glass (1900-1950) Valuation Guide by Ken Arnold. 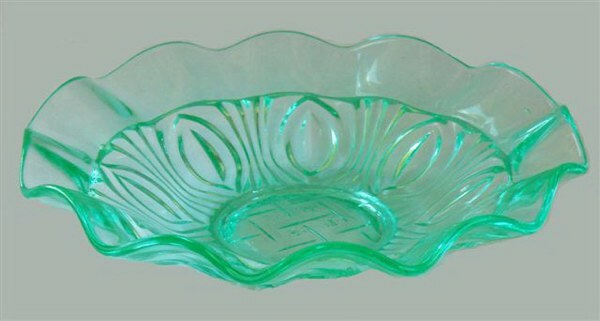 STYLE: The glowing quality of this bowl is most attractive! Please take note of the three types of finish available from the manufacturer. Thank you, Colin, for supplying these examples for viewers! 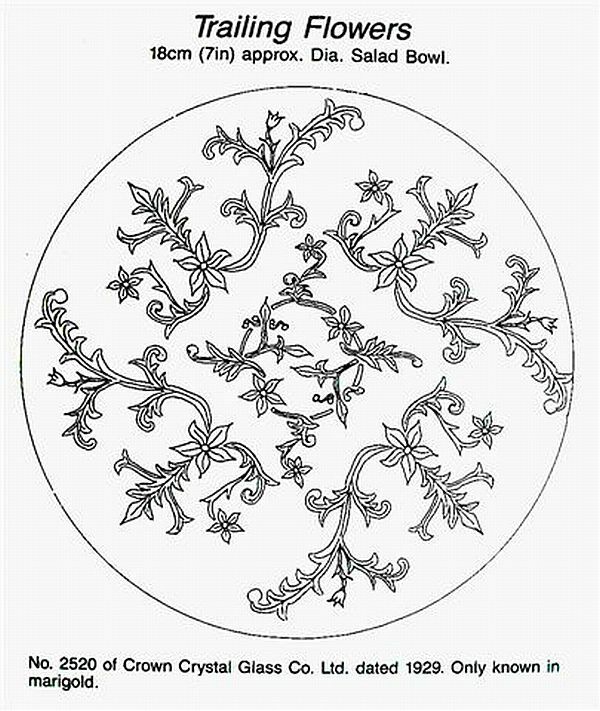 Please take note of the interior lattice design on this bowl. Some bowls have a plain center. Edges can be round or ruffled. Pg. 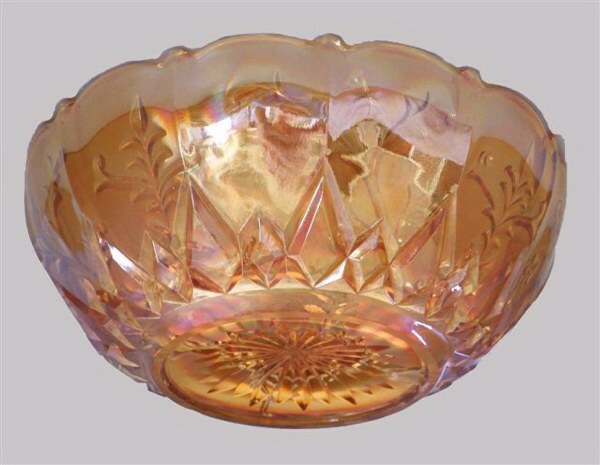 54, CARNIVAL GLASS of AUSTRALIA - Refer to Crown Crystal. TRAILING FLOWERS 7 inch diameter Bowl - 2.5 inches deep. Pg. 37- Australian Glass (1900-1950) Valuation Guide - Ken Arnold. CROWN of DIAMONDS exterior of TRAILING FLOWERS. TRAILING FLOWERS: This is a product of 1929 and is found only in marigold. 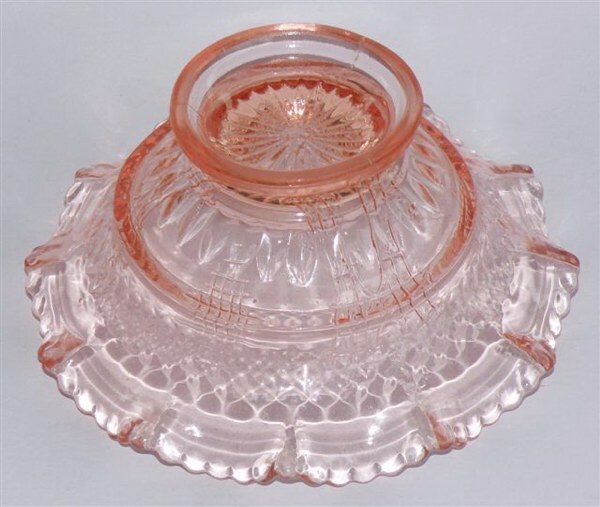 (To our way of thinking: it is one of the most interesting patterns from Crown Crystal! 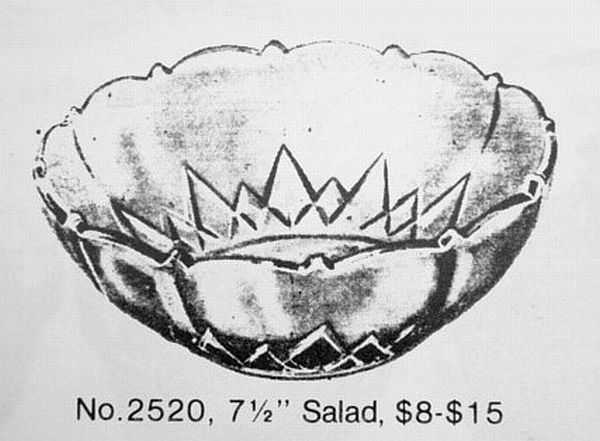 CROWN of DIAMONDS: An interesting exterior for this 7” salad bowl. Spacing of the “points” to offset the ruffles is a very nice feature. Courtesy Remmen Auctions - sold for $60. FLOWER FROGS: These are not mentioned in Carnival Glass of Australia, and we have no further information to offer. The fact that dark ones were produced is an interesting factor. While many various sizes of these flower frogs were produced in America, clear glass or marigold finish dominated the scene.